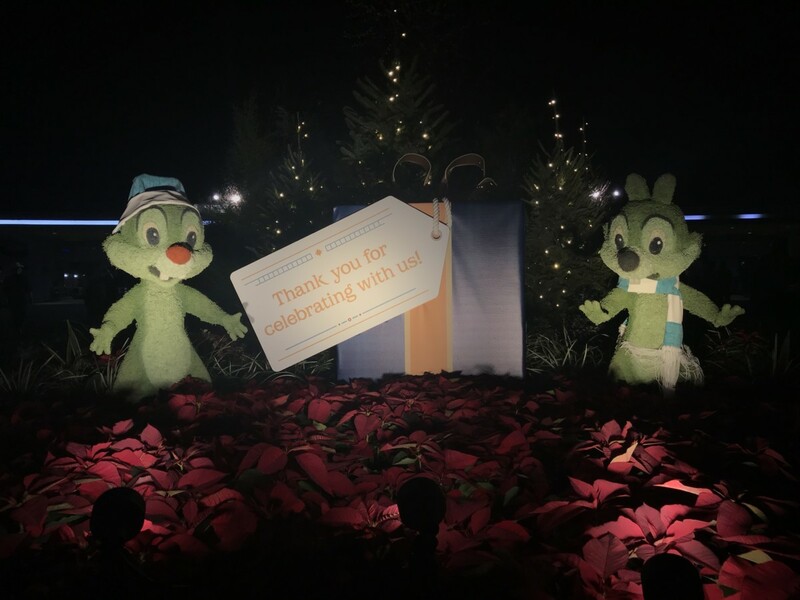 Our annual TMSM Meetup was held at Epcot during the Festival of the Holidays and was the perfect opportunity to taste some of the great holiday offerings from around the world. So myself and fellow staffer Corey Tucker, and our families, set out to sample as much as we could while everyone in the meetup was doing the big scavenger hunt. First up was Canada and the Yukon Holiday Kitchen. We all got the Seared Salmon with Crown Maple Whisky Glaze, Parsnip Silk, Apple Chutney, and Hazelnut Croquant. We all agreed this was delicious. I particularly liked the apple chutney. All parties agreed this was two thumbs up. Corey and his wife also tried the Maple Büche del Noël. This is a Maple Mouse rolled in Gingerbread Chiffon Cake with Cranberry Sauce and Pecan Crumble. To quote my friend Cory, this was “Dang Good!” They both really liked it. Next up was France and the Le Marché De Noël Holiday Kitchen. First up is the Napoléon de Saumon Fumé, Brioche á l’aneth, which was a Smoked Salmon Napoleon in a Dill Brioche. This was really good. Full of flavor and a great sized portion. Also from France we got the Bouchée à la Reine Traditionelle. This was Turkey and Mushrooms in a Veloute Cream Sauce and served in a light Puff Pastry. This also was really good. I particularly liked the sauce and the flaky pastry. I would definitely order this again. Of course our resident sweet tooth, Corey, got Bûche de Noël au Chocolat “Christmas Log” from the France Holiday Kitchen. This was a Chocolate Cake with Dark Chocolate Caramel Ganache. To quote Corey again, this was “Dang Good!”. Definitely on our list to try next time. Next stop was the new L’Chaim! Holiday Kitchen. I got the Potato Knish with Herb Sour Cream. This was a huge portion and very heavy. It was good, but very filling. Our final stop of the night was the Sapphire Holiday Kitchen in Morocco. My husband tried the Grilled Lamb Kefta Kebab which was a Whole Wheat Pita, Cucumber, Olives, Tomatoes, Mini Yogurt Sauce and Harissa cilantro Dressing. I did not taste this one because I was so full from my potato knish, but my husband said it was very good and he would definitely order it again. I did have a little bit of room left to try the “Sfenj: which were Warm Beignets with Cream, Sugar, Toasted Almonds, and Chocolate Sauce. This was one of my favorite things and I will be getting this one again. The cream tasted like the kind of cream you would find in a Boston Cream donut. So good! After all of our tastings halfway around the world, we were stuffed and couldn’t try anymore food. So I’m hoping we get to go back and taste some more and share with you what we had. If you are visiting Epcot this holiday season, I highly recommend tasting the foods from around the world. They will not disappoint. Happy Holidays!